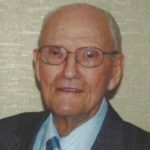 Frederick A. Dhuse, age 100 of Yorkville, IL passed away at his home, surrounded by his loving family, on Saturday, February 9, 2019. He was born on June 12, 1918 in Kendall County, IL the son of Albert and Minnie (Hage) Dhuse. Fred was united in marriage on December 28, 1943 to the former Miss Harriet Henne and they spent the next 75 years happily together. He was a lifelong member of Cross Lutheran Church in Yorkville, IL. Mr. Dhuse proudly served his country in the United States Army during WWII and was a member of the Yorkville American Legion Post #489. Fred was a loving husband, father, grandfather, great-grandfather, brother, and uncle who will be deeply missed by his family and many, many friends. Fred is survived by his wife, Harriet Dhuse of Yorkville, IL; his children, Richard (Patricia) Dhuse of Wood Dale, IL, Merrie (John) Woodward of Yorkville, IL, Susan (Michael) Larson of Newark, IL and Christine (Russ) Anderson of Sheridan, IL; his grandchildren, Gregory (Katherine Henry) Dhuse of Chicago, IL, Lindsay (Connor) Durkin of Naperville, IL, Deanna (Don) Lage, Josh (Kylee) Larson and Amanda (Martin) Cunningham; his great-granddaughter, Eliza Durkin and several other great-grandchildren; his brother, Delbert (Juana) Dhuse of IL; also several nieces and nephews. He was preceded in death by his parents, Albert and Minnie Dhuse; his daughter, Victoria Lynn Dhuse; his brother, Robert Dhuse and his sister, Marilyn Nelson. A Funeral Service will be held at 2:30 pm on Sunday, February 17, 2019 at Cross Lutheran Church, 8609 Rt. 47 in Yorkville, IL. Friends may visit from 1:00 pm until the Hour of Service on Sunday, February 17, 2019 at the church in Yorkville, IL. Be the first to share a memory of Frederick.